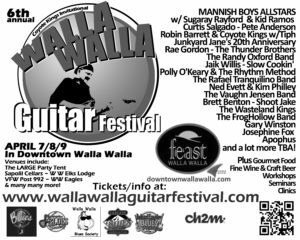 The 2017 Walla Walla Guitar Festival gets (even) LARGER! Now in their sixth year, The Walla Walla Guitar festival has gotten even bigger than ever before. Combining forces with Feast Walla Walla, you’ll be treated to amazing national and regional acts, along with gourmet food and wine offerings. This multi-venue event will host approximately thirty bands performing in downtown Walla Walla starting with a jam on Thursday, April 6, with the main festival taking place Friday, April 7 through Sunday, April 9. It all opens up at Sapolil Cellars on Thursday night with a pre-festival jam hosted by Randy Oxford and Robin Barrett. On Friday, the festival officially kicks off with a 7:00 pm performance at Walla Walla Elks by Alligator recording artist and multiple Blues Music Award winner, including the 2013 BB King Entertainer of the Year, Curtis Salgado. Friday will continue with The Friday Kick-Off Party, at The Eagles, The Elks, The VFW and Sapolil Cellars with performances from Junkyard Janes celebrating their 20th Anniversary, Shoot Jake, Brett “Bad Blood” Benton, Iguana Hat, Frog Hollow and Josephine Fox. On Saturday, an acoustic showcase will begin at noon at The Elks with two acts; Chicago’s Jaik Willis and glass neck guitar master Ned Evett. Multi-platinum awarded master guitarist Pete Anderson will appear at The Elks. And the “Large Show” will be held in the Feats Party Tent with Robin Barret & The Coyote Kings featuring Tiph Dames, and The Mannish Boys All Stars with Sugaray Rayford, Kid Ramos, Anthony Geraci, Jimi Bott, Willie J. Campbell and Allan Walker. The Guitar Crawl begins at 8:00 pm at Sapolil Cellars with Debra Arlyn and Rafael Tranquilino, while at The VFW Post 992 The Thunder Brothers and Vaughn Jensen will hold the stage. The Walla Walla Eagles will host The Randy Oxford Band along with Polly O’Keary and The Rhythm Method. An all-star jam will be hosted by Vaughn Jensen from midnight ‘til 1:45 AM at the VFW to end out the night. On Sunday Morning, the Downtown Gospel Brunch will feature a gourmet breakfast buffet while International Blues Challenge third place winner Rae Gordon will provide Southern Gospel performances, as you enjoy your Mimosas and Bloody Marys! The Coyote Kings Invitational Walla Walla Guitar Festival is brought to you by Robin Barrett & Coyote Kings Tourism ,Walla Walla, The Downtown Walla Walla Foundation, The Walla Walla Blues Society, CH2M, The Washington Blues Society, The Cascade Blues Association, The Inland Empire Blues Society and the Blues Therapy Radio Show. The WWFGF is a 21 and over festival. For tickets and additional information, please visit http://wallawallaguitarfestival.com.